The Pivot Arts Festival on Chicago's North Side returns for its sixth season with a stellar lineup of local and visiting dancer/performers. First, catch Corey Smith's "The New Prairie School at the Colvin House" ( Saturday, June 2, 7 p.m.; Sun. June 3, 4 p.m. ) as he and fellow performers Ethan T. Parecll and Claire Saxe dance, sing and narrate their way through this historic Chicago mansion. "The New Prairie School" debuted last January at Links Hall as a dense, dynamic and highly entertaining love letter to the Midwest. The festival continues with a shared evening ( Thursday, June 7, 7 p.m, at The Mundelein Center at Loyola University, 1020 W. Sheridan Rd. ) from queer Chicago dancemaker Anna Martine Whitehead and New Orleans-based choreographer Shannon Stewart in collaboration with musician Aurora Nealand. Whitehead will present a work-in-progress entitled "Notes on Territory," which is being called a "transdisciplinary movement piece framed in the guise of a PowerPoint presentation." Stewart and Nealand also keep "the body" central to their work. Stewart has spent years researching and exploring gender, race and sexuality in performance and strives to destabilize expectations of traditional gender imagery. Together, in their work "Hysteria and the Body Electric," Stewart and Nealand "explore how popular media ( television, news, social media ) portray and affect our ideas of intimacy, vulnerability and identities." The festival ends ( Sun. June 10, 7:30 p.m., Parish House, 1244 W. Thorndale Ave. ) with "The Rossini Project," an adaptation of Rossini's opera The Barber of Seville by the Chicago Fringe Opera with the acclaimed street-dance/hip-hop duo BraveSoul Movement ( Daniel "Bravemonk" Haywood and Kelsa "K-Soul" Robinson ). Together, Bravemonk and K-Soul are powerhouses on stage; one can only imagine what their vibrant style will bring to this re-worked opera. Sharing that bill is a work-in-progress from the Ginger Krebs Performance Project entitled "Escapes and Reversals." Krebs has long been fascinated by the triumphs and mishaps of diligent human effort especially when compared to the flawless efficiency of our digital world. This new work for five dancers promises to portray exertion, futility and humanity in its most urgent physical forms. For tickets and festival details, visit PivotArts.org/Festival. Speaking of effort, Chicago dancemaker Victoria Bradford has been planning a massive tour de force performance project called "Relay of Voices." This multiyear endeavor culminates in a 100-day relay run from the headwaters to the mouth of the Mississippi Rivera 2,300 mile expedition on foot. On the way, Bradford and her team of artist/athletes will connect with local communities and make dances related to the stories they hear and the people they meet along the way. Although the full adventure won't start until next year, people ( for free ) can see a mini-version of this piece, "Relay," performed in response to visual artist Brent Fogt's solo exhibition "Do Something Else" at the Chicago Artists Coalition ( Friday, June 1, 6-9 p.m., 217 N. Carpenter St. ). Responding to the shape and form of Fogt's sculptures, Bradford and dancers will perform a three-hour durational relay throughout the gallery and around the city block. This iteration explores "how bodies come together, grab hold … reach for, place, wedge into, and find themselves holding once again." No strangers to durational performance, local dance company, Khecari will present "The Retreat: One Week" ( June 18-24, times vary ). Not to be outdone, this performance lasts foryou guessed itone week. For 168 consecutive hours, co-artistic directors Julia Rae Antonick and Jonathan Meyer ( along with fellow dancers and musicians ) will create an ongoing sensory installation of dance, sound, light and environment. The experience is meant to be a retreat for the audience encouraging "deep engagement and a state of beneficial boredom, positioning this often-suppressed form of attention as radical engagement with time and self," according to a press release. Khecari has so carefully designed the entire event that we have to apply to become audience membersthey will decide when it is best for us to attend. To find out more about where this radical, one-of-a-kind performance will take place and to apply for admission visit Khecari.Org/The-Retreat. For something a little more laid back, Catalyst Movmnt presents "Black Coffee & Raw Sugar" ( 1474 N Milwuakee Ave., Sun., Jun 24, 7:30 p.m. & Sun., Aug. 26, 7:30 p.m. $8 tickets at the door ) a bimonthly performance showcase featuring work by movement artists of color. ( This company is distinguished from another company called "Catalyst Movement." ) Held in the informal setting of Outerspace Studios in Wicker Park, the series promotes visibility, risk-taking, truth-telling, good vibes and great work. Check it out the last Sunday of every other month. Things quiet down for a bit in July and August but come back with a bang with Dance for Life Chicago on Saturday, Aug. 18 ( Auditorium Theatre, 50 E. Congress Pkwy. ). Dance for Life Chicago brings together a slew of renowned Chicago dance companies to celebrate the vibrancy of our communities and raise money for Chicago Dancers United's Dancer's Fund, an invaluable resource for dancers struggling with health and medical needs. 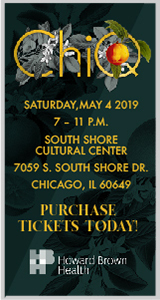 This year, there will be performances by Dance For Li fe partner companies Giordano Dance Chicago, the Joffrey Ballet and Hubbard Street Dance along with work by Hanna Bricston and Dancers, Cerqua Rivera Dance Theatre, Chicago Dance Crash and Nomi Dance company. Tickets go on sale May 18; visit ChicagoDancersUnited.org/Dance-For-Life. Lastly, the summer simmers out with the annual return of The Fly Honey Show. Everyone's favorite gender-bending, body-positive cabaret ( led by choreographer Erin Kilmurray ) returns for a rumored five weekends of performances at the end of this summer. The juicy details of this year's location and lineup are still under wraps but much will be revealed in the weeks to come. Keep an eye on the hive at TheFlyHoneyShow.com .